The “caviar” on my mind these days involves black-eyed peas, not those extravagant little fish eggs. 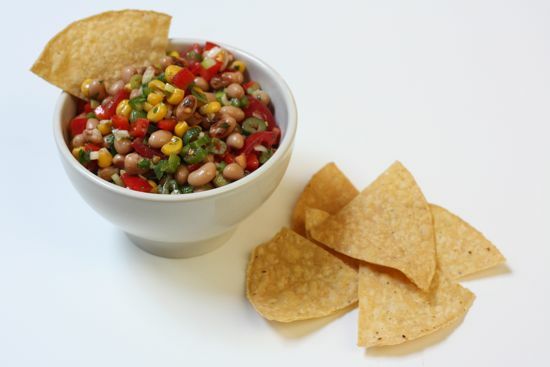 Marinated with chiles, onions, bell pepper, corn and tomatoes, the humble legumes are transformed into the classic Texas caviar. This chunky salsa is a staple in the Lone Star State–a little bit Southern, a little bit Mexican, and altogether irresistible. Countless variations have made the round of backyard barbecues and tailgate parties since the 1950s, but the original was the creation of Texas culinary star Helen Corbitt, a cookbook author who served as food consultant for Neiman-Marcus in Dallas. I’ve been thinking about this dish ever since I made it for good luck last month. Southern folklore says you’ll get a dollar in the coming year for every black-eyed pea you eat on New Year’s Day. Inflation has sort of reduced the fiscal return on that deal, I’m afraid. I can’t eat enough peas to make a difference in my bank balance, but it still makes me feel good to uphold tradition. Super Bowl is my excuse for sharing it now. I don’t care much for football, but I do like the snacks. This recipe updates the original, with home-cooked peas rather than canned, and adds tomatoes and corn kernels for color, texture, and fresher flavor. I’ve reduced the oil a little, too. It would be a guilt-free indulgence if I could just pass on the tortilla chips. But we all know that’s not likely. Don’t be put off by the idea of cooking the peas from scratch. There’s nothing to it. They don’t require soaking in advance and cook more quickly than you would imagine–usually about an hour of untended simmering. Or you can throw them in a slow cooker (after soaking) for 3-4 hours on high. The cooking time will depend on how dry the peas are. When they’re tender to the bite, they’re done. Just remember not to add salt until the end of the cooking time since it is thought to make beans tough. Alternatively, just open the cans. I found cans of organic black-eyed peas at Whole Foods that were quite good and not too salty. Even with canned peas, this salsa would be the star of any casual get-together. Say, a Super Bowl party? Pick over and rinse peas. Place in a medium saucepan with about 6 cups of water and bring to a boil. Reduce heat, cover, and simmer until tender, about 45 minutes to an hour. Remove from heat, cool and drain. 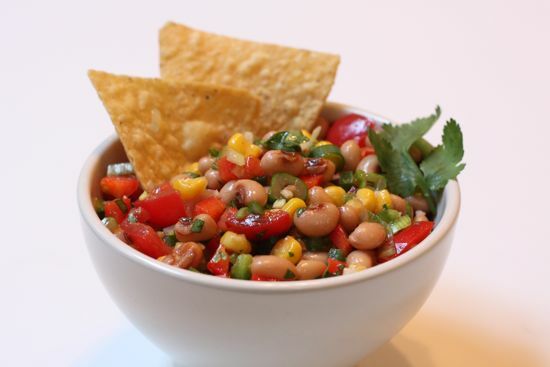 In a large bowl, mix drained peas, corn, onions, garlic, tomatoes, chiles and bell pepper. Whisk olive oil, vinegar, cumin, salt and pepper together in a small bowl or shake together in a small jar. Pour dressing over pea mixture and stir to coat. Cover bowl with plastic wrap and chill for at least 4 hours or overnight to allow flavors to come together. Just before serving, add cilantro and toss well. Serve with tortilla chips as a party dip or on a bed of lettuce as a salad.